The strengthened governance of the EMT Initiative was first discussed at the EMT Global meeting in Panama (December, 2015) with the agreement to establish the Emergency Medical Teams Strategic Advisory Group (SAG). It was also agreed that Regional meetings should be initiated in 2016 covering three major regions: Americas, Asia-Pacific and Europe-Africa-Middle East. Regional meetings provide a forum for discussion and agreement between member states and EMT providers on topics such as training, exercises and capacity building as well as a focus on regional response. 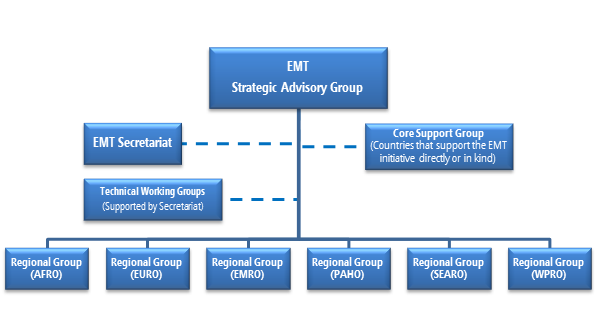 Each regional group will have direct representation on the SAG of EMT and represent the collective views of their region at that forum (Figure 1).